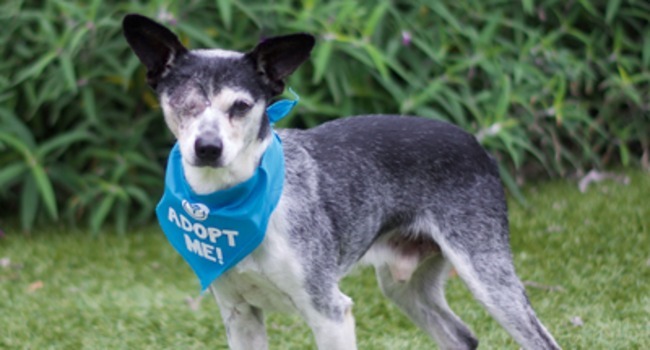 Super-Senior Snoopy Is A One-Eyed Wonder Who Loves To Give Kisses…! 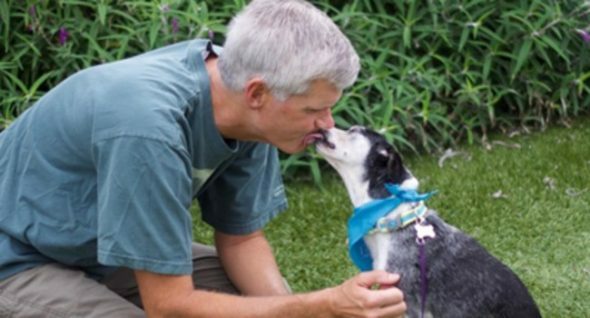 Snoopy, rescue volunteers say, is at least 15, but he has so much love left to give! This adorable small-breed mix came to Peace of Mind Dog Rescue from the Salinas Animal Shelter in California. Snoopy is at least 15 years old, but may be as old as 19 according to his previous guardian! According to shelter sources, Snoopy lived most of his life as an un-neutered outdoor dog. Though his best friend, the 15-year-old son in the family, would sneak Snoopy into the house when his folks weren’t around, most of Snoopy’s days were spent chained up outside. Several weeks ago, Snoopy’s lead broke and he was able to jump the fence and take himself for a walk. A Good Samaritan found him and took him to the local shelter. Snoopy’s family did call the shelter and found out he was there, but they could not pay the impound fees necessary to get Snoopy back. The shelter held onto Snoopy for 30 days hoping that the family would come for him, but they did not. That’s when shelter staffers reached out and asked POMDR to take Snoopy in because he needed extensive dental and medical care. With the help of The Grey Muzzle Organization, Snoopy received an exam and senior blood panel, which showed that he was healthy enough to be anesthetized. He was neutered, had a diseased eye removed, and had 15 rotten, infected teeth taken out. Post-recovery, he’s a whole new dog! And he loves to give fresh doggie kisses!